One of my friends recently made a sea change so this will be her first Christmas by the beach - this card may be for her! 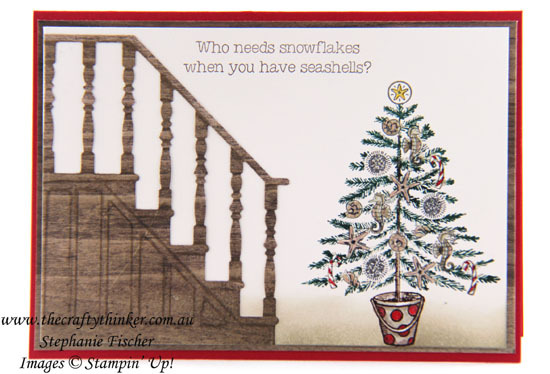 Christmas Staircase meets Beachy Little Christmas - a stamp set so suitable for Xmas in Australia! Having cut the staircase from Wood Textures Designer Series Paper with the die from the Christmas Staircase Thinlits, I used a Crumb Cake Stampin' Write Marker to emphasise the lovely embossed details and add a little shading. I stamped the tree image from Beachy Little Christmas in Sahara Sand ink and then, using a Garden Green Stampin' Write Marker, inked the branches. I don't think I could have done this manually - I made use (finally!) of my precision stamping folder (like a Misti). I then used Stampin' Write Markers to add colour and definition to the rest of the image. Having masked the bucket, I then sponged on some Crumb Cake ink to provide a suggestion of flooring and stamped the sentiment in Chocolate Chip ink. Lastly, I added a layer of Wood Textures paper to the Real Red base card before adhering my card topper.